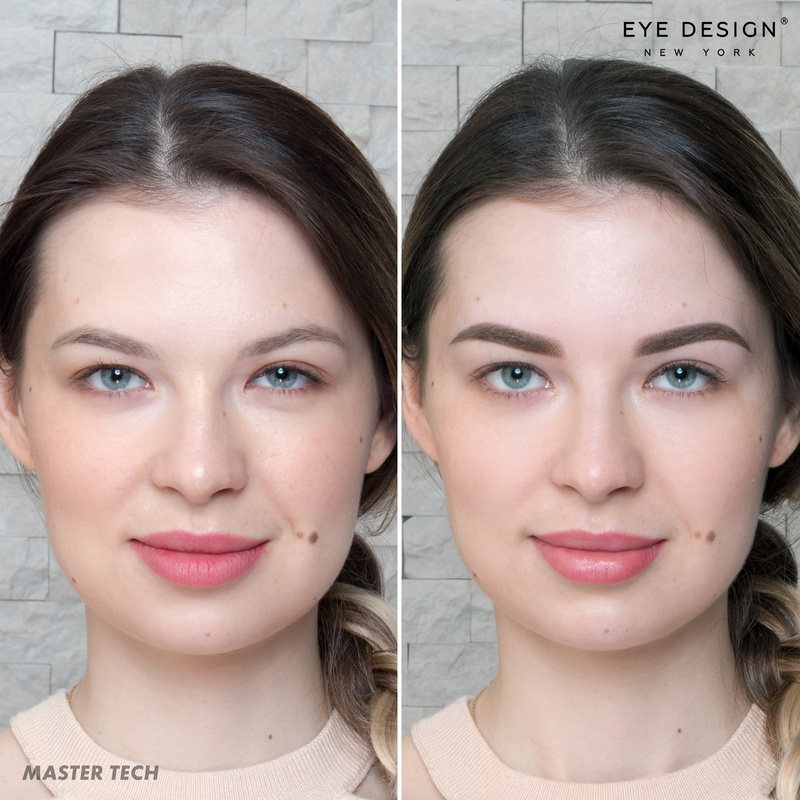 Bold brows vs. subtle changes: Which do you prefer? Eye Design has a wide variety of clients. From browsing our social media, you may notice that we treat clients of all ages, skin tones and skin types. Have you also noticed that we have clients with all different personal preferences and end goals for their brows? From clients who want subtle hair strokes with micro-feathering to those who want a bold makeup look, Eye Design’s technicians can create a range of beautiful brows. Most clients want something in between these two extremes. Our team is expertly trained and highly experienced. We treat everyone as an individual so we can give you a customized look you will love. Microblading is for clients that are looking for hyper-realistic hair strokes. Application of light, soft and overall small hair strokes is called micro-feathering, and is a toned-down version of microblading. These techniques are great for clients who prefer no makeup or “no makeup” makeup. Clients can always choose to go bolder at their touch-up appointments, or layer makeup products on top for special occasions. Powder Effect, developed by Eye Design’s founder and Master Technician, is a semi-permanent makeup solution. Different from microblading, it uses pin-dot pigment application to create a shaded gradient look. Also known as shadow effect, ombré brow or microshading, Powder Effect is for clients with medium to full natural eyebrow hairs. It shapes, defines and darkens the brows, just as you would with makeup products. Much like traditional makeup (think: pencils, powders and pomades), Eye Design’s Powder Effect treatment can range from a soft wash of color to intense pigmentation (or anything in between). Unlike makeup, however, our work never smudges or fades throughout the day. Instead, it fades naturally over time. Results mimic the look of freshly applied makeup and last approximately 12 to 18 months. Our technicians can also combine microblading and Powder Effect for the ultimate eyebrow makeover! First, the technicians create hair-like strokes during microblading, then add Powder Effect between the applied hair strokes. Powder Effect softens the contrast between the skin and the freshly applied hair strokes. This gives the client extremely natural-looking final results without any need to layer traditional makeup on top (unless you want to, of course)! Nadia Afanaseva, Eye Design’s founder and Master Technician, worked hard to develop perfect pigments for microblading, Powder and Hybrid clients. Alongside chemists and doctors, Nadia developed six premium, mineral-based and hypoallergenic Microblading Pigments. They have a thick gel-like texture that is ideal for creating crisp hair strokes during the microblading process. In addition to the six base shades, we have four correction pigments that our technicians use when working on clients who have had previous microblading. We also use these to make custom colors for certain clients. Earlier this year, Nadia launched her long-awaited Powder Effect Pigments. Our team spent months developing six exclusive shades, testing them on models and eventually clients. Now, they are available for beauty professionals worldwide to shop! Eye Design’s technicians--and clients--have been loving the results! Powder Effect Pigments are now a staple in our studio. To schedule an appointment or a consultation with us, call our studio at (917) 300-0317!